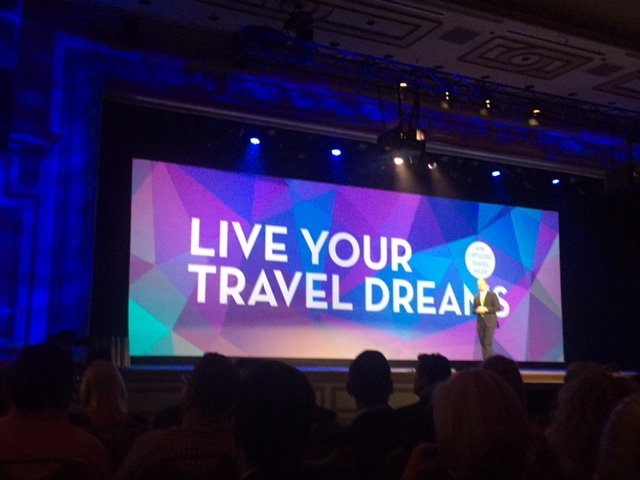 Virtuoso CEO Matthew Upchurch took to the stage in front of 4,000 travel industry professionals this week. The time honored cliché of being invited to dinner…and then being forced to sit through a sleep-inducing, soporific slide show of your friends’ recent vacation has been replaced by instant photo posts on Facebook, Twitter, Instagram and the other social media sites. “More and more travelers are choosing destinations which are not just on their bucket lists but also to create bragging rights,” said Tony Huffman, a travel advisor (they’ve eschewed the term ‘agent’) who spoke at this week’s Virtuoso Travel Week in Las Vegas. A selfie while ballooning over the Great Wall? Look Ma, no hands! Virtuoso is a luxury travel company which pairs its’ 373 independent advisors in 30 countries with 1,700 rigorously vetted approved providers: resort properties, hotels, tour guides, and cruise ships. A combination of over 4,000 of them gathered this week to build relationships and compare notes to match up traveler desires and demands with destinations. The savvy traveler demands an experience beyond booking airfare and a hotel online. “They are looking for authentically local, immersive experiences. They want to not just view the art at Musee d’Orsay in Paris, they want the opportunity to paint there, too. They want to stay on a working farm in Tuscany or Napa and help prepare and cook farm-to-table cuisine. They want to be cool,” said Jack Ezon, a Virtuoso advisor with Ovation Vacations. “’Millennials,’ especially, are willing to get dirty and be in politically intriguing places with a touch of turmoil, but close out the day in the comfort of a luxury hotel and with the assistance of and security provided by a guide. They want the guides to hang out with them and take them where the locals go more than in their traditional, academic role of dispensing historical information,” said Kelly Grumbach, with Quintessentially Travel. One Virtuoso tour operator, Norman Howe, of Butterfield and Robinson, is already planning guided trips to Iran and Cuba. A review of autumn bookings, compiled by Virtuoso’s Misty Belles, reveals that traditional favorites Italy, Mexico and the United Kingdom are the top three most popular destinations; but, growing fast by percentage are Vietnam, India, and French Polynesia. “Expedition cruises are up 41-percent, and African safaris are very popular with families,” said Belles. And announcements by luxury cruise companies at Virtuoso Travel Week included partnerships with celebrity chefs, such as French Laundry’s Thomas Keller; and a ship outfitted with an in-cabin spa for unlimited treatments throughout the cruise. “In the era of personal trainers, hairdressers, therapists, nutritionists, and personal chefs, a trusted travel agent seems vital to make worthwhile, quality decisions with your time and money,” said Upchurch. Michael Patrick Shiels may be contacted at InviteYourself@aol.com His talk show can be heard weekday mornings in Lansing on 92.1 FM .